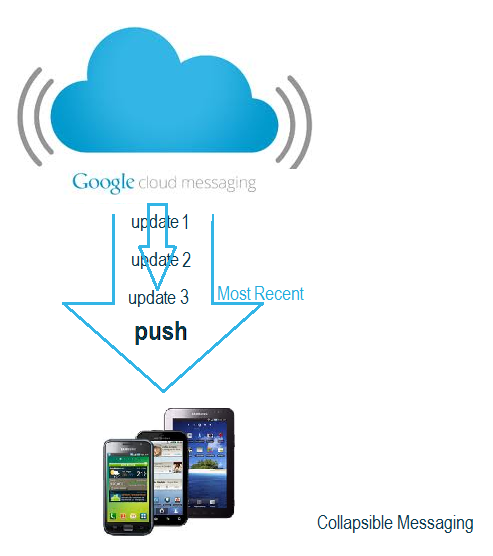 In a previous article, we looked at how to set up Google Cloud Messaging (GCM) in Android applications. We learned that GCM is a free service that allows us to push messages from the cloud to a number of mobile recipients running our Android application and registered with our service. The push messages can be either collapsible or non-collapsible. "Collapsible" means that the most recent message overwrites any previous ones queued for sending. A typical example of collapsible messaging is a live game score. In case previous score updates haven't reached their destination yet, the Android clients would only get the latest one. This happens however on a best effort basis: the order in which messages get sent in GCM is not guaranteed, so in some cases the "latest" message may not be actually the most recent one. Take a Baseball game between the Boston Red Sox and the New York Yankees as an example. Here's how we would construct a collapsible update to send to devices registered with our sports push notification service. All code samples here are slight modifications of the GCM Demo application . As commented in the previous article, the reader is invited to download the Demo (both client and server) and experiment. The Demo uses the GCM helper library for Java that abstracts much of the low-level stuff (like handling messages in JSON format). .collapseKey("Fenway Park Game") // The key for all updates. .timeToLive(600) // Time in seconds to keep message queued if device offline. .delayWhileIdle(true) // Wait for device to become active before sending. It's worth noting that a given GCM message can be sent to up to 1,000 mobile clients at a time. In case our user base is larger than that, we'll need to break the message sending process in chunks of 1,000 recipients. One way to do that would be to use a java.util.concurrent.Executor thread pool and send the chunks asynchronously, as does the GCM Demo server. String message = intent.getStringExtra("collapse_key")  + "\n"
+ intent.getStringExtra("team1") + " "
Notice how a collapse_key is set up by the server and retrieved by the client. That key is how GCM identifies the flow of collapsible updates for a given event. In case there are several push notifications queued for sending with the same collapse key "Fenway Park Game", only the most recent one will be delivered. We can see why collapsible push makes sense here: let's suppose we were using non-collapsible messages and the score was updated say 4 more times during the game. Let's imagine a common occurrence where some of our users didn't get the first notifications and became reachable again right after the latest score. Then they would get all five messages instead of just the last one. All the messages except the most recent one would be useless and we would have over-notified those clients. That wouldn't be very smart. We want our application to be useful, not annoying. As mentioned, collapsible messages are not guaranteed to get to their destinations in order, but they still allow us to use GCM intelligently and refrain from being too...pushy.